Check in time is 3 p.m. Check out time is 12 p.m. The uniquely designed Route 66 Hotel and Conference Center is locally owned and operated in the heart of Illinois on the historic Route 66 in Springfield. 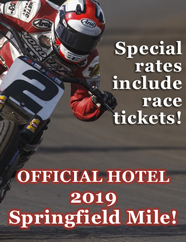 Need a last minute hotel in Springfield, IL? Call us at 217-529-6626!